Some people only look for a house sitter for a weekend, others are going away for half a year, to spend the winter in their summer house in the Caribbean. Most offers are for a few weeks, coinciding with the average time of a vacation. A lot of people want to get away for Christmas, and who can blame them? I read a lot, but, with few exceptions, I feel no urge to maintain physical possession of books after having read them. Quite the contrary, I find them put to much better use if I pass them on as gifts, leave them in public places or donate them to a library. Walking through Calgary, I came across this beautiful box, part of the Little Free Library network, next to a bus stop on 4th Street/27th Avenue NW. Enchanted, but not expecting much, for these boxes usually hold thrillers, fantasy or girly novels and other books that are given away for a reason, I nonetheless peeked inside. Hope never dies. To anyone waiting at the nearby bus stop, it must have seemed that I had found a chest of gold or, to use a metaphor more suitable to Alberta, struck oil, for my smile widened and my eyes lit up, discovering that some gentle soul in the neighborhood had deposited books by William Somerset Maugham. To whoever it was, thank you very much! Rarely have I found such good literature and exactly what I have been wanting to read in one of these little library boxes, but this was perfect! I had just read Maugham’s The Moon and Sixpence and the Ashenden short stories, satisfying both my guilty pleasure of spy stories as well as my appreciation of good literature. Good news: the days are getting longer. Unless you live in the Southern hemisphere, then you are doomed to darkness. And unless you live on the equator, in which case you are missing out on something fabulous. My sister asked me why I am on TV all the time. I had no idea, so she sent me this photo. It seems there is a guy trying to copy my style, my demeanor and my looks. Careful, only I am the real one! You remember the article about my birthday walk from Vienna to Bratislava? I am delighted to read, and thankful to Tim Burford for bringing it to my attention, that my steps followed those of Patrick Leigh Fermor, role model in terms of wandering and writing, if only for one day. Rereading the passage about Carnuntum in my article, I notice that I didn’t know that he had stopped there, but that, by some eerie coincidence, I have referred to him in exactly that part of my article. If you don’t know Mr Fermor, I suggest that you order A Time of Gifts right away. I know of no better travel book. For International Women’s Day, let me remind you of its purpose. To celebrate the 10th anniversary of the financial crisis, I am completely broke this year. One of my jobs as a non-native English speaker is to correct the US President’s English. Having a cold heart reduces the risk of being killed by a heat-seeking missile. I had a Google alert for “Andreas Moser”, hoping I would receive news about myself. All I learned, though, is that there are many people with the same name. But nobody expected them to use their embassies to film gruesome splatter movies. I find it inspiring to set up an aspiring spy ring. Thanks to the anonymous benefactor who sent The Know-It-All by A.J. Jacobs. I am wondering if this is a fitting homage or an allusion to my smartassness. I feel sorry for the people who want to become scientists and accidentally become scientologists. My sleep pattern has no problem with jetlag. But my stomach is confused. Maybe Saudi Arabia is very modern, offering assisted suicide for its citizens. You want to end your life? Just write a critical blog, and the Kingdom will take care of everything. Facebook says I respond to 10% of your messages. I say, just give me some time. Until the next winter, at least. This Lent, I will forgo work for 40 days. When people ask me what part of Germany I am from, do they think that we are still divided into East and West? This film about communist Romania is now playing on Netflix. One of the neighbors estimated my age at 26. But I don’t know if it was my looks or my irresponsible lifestyle. Quality of life could be measured by the time between the decision to go to sleep and when one actually falls asleep. a. A drone brings Gatwick Airport to a standstill. b. No Zeppelin flight has ever been impeded by a drone. => Zeppelins are superior to fixed-wing aircraft and should be reintroduced on a large scale. Why I don’t run in winter. The tobacco tax rates in Alberta (129% on cigars) are good for my health. Thanks mainly to Christian voters, Brazil is now going to try out a fascist president. And the German Brazilians were reliable in their support, too, it seems. Because in the state of Santa Catarina, where most emigrants from Germany settled, Bolsonaro got almost 76% of the vote. Similarly, Wisconsin was the US state with the highest influx of German immigrants. Might that be the reason why high school students there show the Nazi salute when posing for a class picture? The London Riots in August 2011 were better organised than Brexit. With everyone self-radicalizing, I want to become a radical atheist. Donald Trump actually corrected his tweet a few hour later. But he never said “thanks”, of course. When people thank those working over the holidays, they mention police officers, nurses, soldiers and bus drivers. They always forget about spies. Speaking of spies, Tony Mendez has passed away. That’s a good opportunity to watch Argo again. When I came to Calgary, my postcards from Vienna and from Andalusia were already waiting for me. Another postcard from Velez Blanco made it to Romania. And in Peru, someone is happy about a postcard from Bavaria. Often, I find arguments too filiopietistic, but I can’t think of the word when I need it. Hawaii is considering to raise the legal minimum age for smoking at 100 years. That’s tough, I thought, until I read that cigars will be exempt. Thanks a lot to Angie Kordic for the books The Confidential Agent by Graham Greene and It can’t happen here by Sinclair Lewis! It’s nice when former flatmates stay in touch over the years. Setting the record about German efficiency straight, there is a podcast about the disaster of the new airport in Berlin. Thanks to Jeramy Flora for Yuval Noah Harari’s 21 Lessons for the 21st Century! Does anybody have experience with Patreon? I am curious to try it, so I can remove the annoying ads from the blog. And with enough revenue, it would allow me to devote more time to better and more in-depth articles. In the old days, before Erasmus, academic exchanges were still complicated: visa, health insurance, exchanging money. And then there was no internet, so you couldn’t start looking for accommodation before the move. The first week was usually spent at a hotel, buying a newspaper every day and telephoning all the “room offered” ads in the classifieds section. Foreign students coming to Germany faced an additional hardship: they had to decide in which of the two Germanys they wanted to study. If you are surprised by the last sentence, you are either too young or you grew up (like me) in West Germany, where we would assume that, given the choice, everyone would naturally prefer West Germany over East Germany. “And you couldn’t travel that easily to East Germany,” many will object, but I just listened to an audio document from 1988, which completely destroyed this and other assumptions I had been holding. In the last full year of German separation, Deutschlandfunk, a West German radio station, interviewed British students of German studies who had spent exchange semesters in West Germany and in East Germany, some of them even in both countries consecutively. Thus, they could report from both Germanys with first-hand experience and were able to compare their experiences. If you speak German, I recommend listening to the show. The students’ observations are refreshingly open and spot-on. And there is a ton of surprises in there, beginning with the mere fact that there was an academic exchange between the UK and the GDR (German Democratic Republic, the official name of not so democratic East Germany) at all. To the students from Britain, East Germany seemed more exotic than the FRG (Federal Republic of Germany, the official name of West Germany and indeed of the now reunited Germany), the latter of which one could always visit as a tourist. Thus, many students opted for a stay in the socialist country. The British colleagues experienced the West German universities as rather anonymous mass universities, where they felt left alone, which pretty much describes the state of German universities today. It was hard to make acquaintances, let alone real friends. “The Germans weren’t interested in talking to us,” they said, and many who are currently trying to integrate themselves in Germany are nodding knowingly. In East Germany, on the other hand, the reception was better organized, but also more friendly and heartfelt. The British students suspected that this was due to their exotic status as West Europeans in the GDR. Because they also reported that exchange students from “socialist brother countries” (for example Bulgarians and Poles) were not treated brotherly at all, but with German nationalistic condescension. Any foreigner coming to Germany is afraid of bureaucracy (even today), and both countries were bureaucratic. But in East Germany, there was always someone willing to help, while the students in West Germany all reported hearing the sentences “this is not within our purview” and “that is your problem” over and over again. What they did prefer in the west, was studying itself. 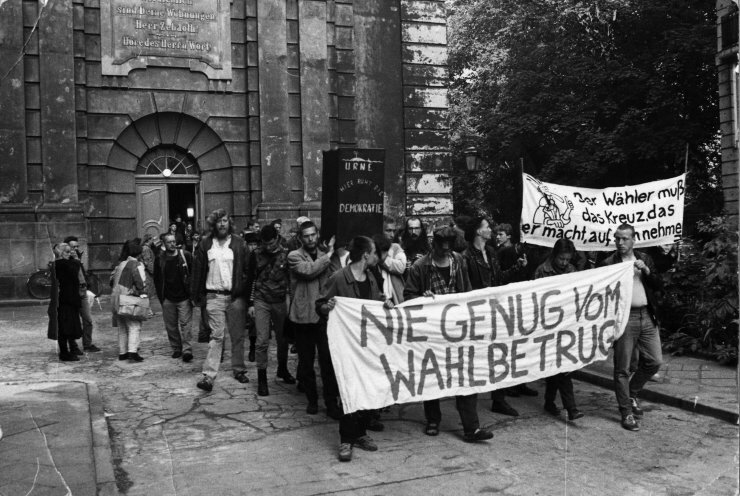 The freedom prevalent at West German universities was confusing at first, but the lectures were at a high academic level. In East Germany, the students felt that too little was demanded of them, and parts of the lectures even seemed “childish” in their anti-capitalist propaganda. Outsiders are of course the perfect people to find out what West Germans thought about East Germans and vice versa. Taking German studies in the UK, the students had apparently learned about both countries in detail (as we have learned from John le Carré, the British Secret Service preferably recruited scholars of German). They were shocked how little people in West Germany knew about East Germany, how little they were even interested. There was an incontrovertible negative image, not based on personal experience and, more tellingly, with no curiosity to make one’s own experiences that might shake the preconceived notions. These descriptions resonated with me, because even today, this is the image of Eastern Europe that many Germans or indeed West Europeans have. It is poor, it is negative, one doesn’t want to travel there, one doesn’t want to meet anyone from there, and one doesn’t want to learn that it’s really not like that. One of the students said that she always received the same reaction when she told people in West Germany that she had previously lived in East Germany: “Oh”, followed by silence. The same reaction I receive when I tell people in Germany about Romania or Lithuania. “Oh”, and then an empty facial expression, laying bare the emptiness of the mental map east of the former Iron Curtain. The interviews end with a surprising moment (from minute 42:25 in the recording). The journalist asked the students, who had gotten to know both German states, where they would prefer to work if they had to choose between East and West Germany. The choice was unambiguous. These intelligent, educated experts on Germany all preferred going to the country which would no longer exist in that way just one year later, not least thanks to the contribution of their fellow classmates there. What do I know of East Germany? More articles about German history. There are countries where I am received with car bombs and threatening phone calls (Malta), and then there are countries where I am received with hospitality and curiosity, leading to newspaper articles and invitations to speak at TEDx conferences (Romania). I am happy to announce that the most beautiful country in Europe, Montenegro, is in the second group. Last winter, when I lived there, I met Ljiljana Lukšić, who writes a travel blog, Lily’s Travel Notes. She asked if she could interview me for her blog and I, hoping to get out of it, explained that my Montenegrin was not good enough by far. But then, remembering that even my grandfather had made an effort to learn Serbo-Croatian when he was a prisoner of war in Yugoslavia, I kept studying until I reached the level where I could at least conduct an interview in writing. The story that explains what became of Serbo-Croatian after the end of Yugoslavia. My favorite Yugoslav film, also useful for learning Serbo-Croatian (with English subtitles). Lily’s Travel Notes, the blog of Ms Lukšić.